1. Two particularly hot items of news for this issue of HKN. 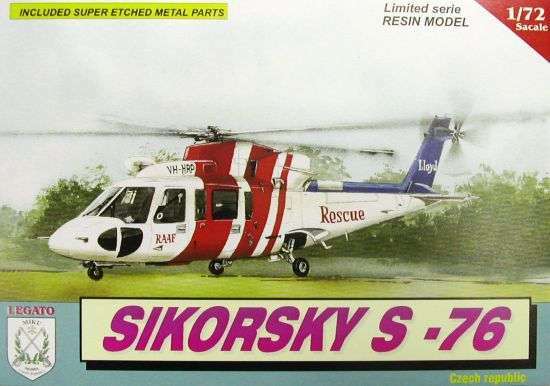 Firstly, Legato will soon be releasing the long awaited 1:72 resin and etched brass S-76 kit that is being made for them by Miku Models. 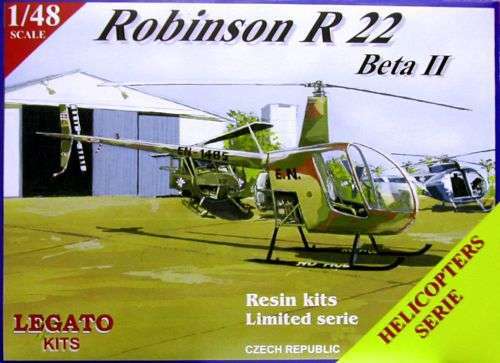 Also scheduled for 2004 from Legato will be a Robinson R-22 in 1:48. 2. And probably even better news for many readers, the MPM group will be releasing an injection moulded 1:72 CH-37 Mojave, almost certainly under their Special Hobby label, as well as a 1:72 AH-1G Cobra. And in 1:48, the Fa.223 Drache first announced in 2002 seems likely to be released this year. 5. Stream (a new name to HKN) have released a set of 1:72 injection moulded Russian missiles. The nine trees of dark grey plastic carry eight pairs of missiles, namely: Kh-25MR, Kh-25MT, Kh-29T, Kh-29L, Kh-25MP, Kh-25ML, R-98, and R-60. As a bonus you will find a pair of external fuel tanks. Heli-modellers will probably find the most use for the R-60 (AA-8 Aphid), and Kh-26MP (AS-12 Kegler). 6. 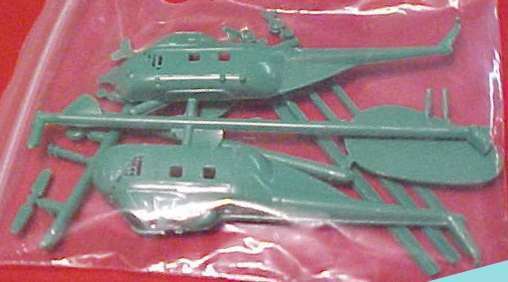 The old ITC (Ideal Toy Corp.) twin kit of a Spad XIII biplane and a Sikorsky S-55 has been re-issued by Glencoe Models, #3103. The Spad now has markings for Eddie Richenbacker, and the H-19 (as it has become) has USAF and US Coast Guard alternatives. These are both rather simple kits, believed to be 1:100 or similar. The picture shows the plastic as originally issued by ITC. Thanks to Yevgeny Borissov and John Boyle.